Cody entered public service through scouting, and earned the rank of Eagle Scout. After completing his Eagle Scout Project by adding to and updating the playground at the Metamora Lions Club, he joined the Lions as an adult member. He has been involved in EMS since 2010. 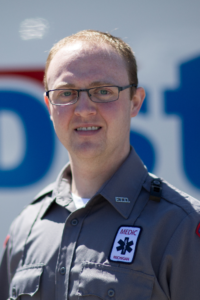 He has been a full-time Paramedic with Medstar for two years, and was recently promoted to Field Training Officer. He previously served as an EMT with Lapeer County EMS for four years. Outside of his time on the ambulance, Cody is a paid-on-call firefighter/first responder for the Metamora Township Fire Department and a volunteer for community CPR and AED programs in Lapeer County with Medstar. He also assists with the Medstar Special Operations Teams, and teaches first aid and safety in local scout and church programs. Cody holds two bachelors degrees from the University Of Michigan, with minors in chemistry and psychology, and is currently enrolled in a nursing education program.